Glinda: The Colourful and Sparkly! Okay… that was meant to be a play on the title of Oz: The Great and Powerful. Did it work? I don’t think so! But it’s nice to try. So I have spent today with my PJs and my super fluffy leopard print dressing gown, eating Pop Chips and sorting/clearing/tidying my room with a green tea detox face pack and the Gavin and Stacy boxset on in the background. I hope I finish soon so I can have at least three hours writing my essay! Today was a bit of a write off day; I was meant to be going on a First Response course in Wendover today (acting as the First Aider for my mum’s Brownie Pack holiday in May) but we woke up to a blizzard! The roads seemed pretty clear but we didn’t want to risk dropping me off at the centre for it to get heavier during the day and for me to be stranded. Typically, half an hour after I emailed the woman to explain and ask to be transferred to a later course, the snow turned to rain and the roads cleared, but living in the Chiltern hills one needs to prepare for the worst! Therefore, I decided what better to do with a ‘spare day’ than try to sort out the mess that is my room. I don’t know why, but it seems to be a haven for chaos! I tidy it up and make a concerted effort to keep it nice and lovely and organised but within about a week it’s a right state again. However, thanks to the purchase of an AWESOME plastic four-drawer tower unit from Homebase and a trip to IKEA tomorrow I hope it will stay better! My parents bought me a pair of amazing shelving units from IKEA when I moved back home after my disastrous attempt at a Masters in Nottingham; they figured if I was going to be living at home for the foreseeable future whilst I get myself sorted and do my MA at Royal Holloway (commutable!) then I might as well have a decent room. I LOVE them! They’re black and the shelves are all at adjustable heights. My dad, being the clever sod he is, even managed to drill through the back of one of them in order to thread the cables through, so my little TV can sit on one of the shelves. It’s at a perfect height to watch from my bed! Typically there still isn’t enough room for all my books and DVDs so I’m going to grab an extra, little bookshelf from somewhere and paint it black if necessary. When my room is in better shape, I might have to take a few pictures and do a ‘room tour’ through the medium of photographs. The IKEA trip tomorrow, however, is to try and find a decent pot (or two) for my make up brushes, a spice rack (for my nail polishes!) and a portable mirror, whilst my mum wants a few more bits and pieces for around the house. Is it sad that I’m really looking forward to it?! I’m always thinking about how my future house will look and I think most of the IKEA stuff is really lovely. Anyway! Apologies for the rather long, essay like beginning to this. Sometimes you just need to prattle on about life! What you’re here for, my dear fat fashion fans, is the goodies! 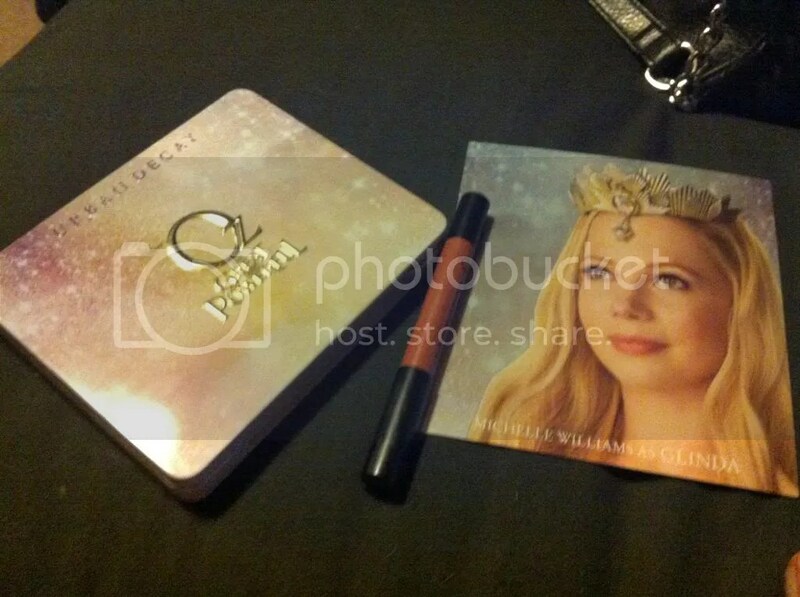 The review of the Urban Decay Glinda Palette! I know there’s a mixed response to this; a lot of people have been saying that the colours are nothing special, for example. As an Urban Decay almost-virgin, however, I love it! I love the colours- totally expected to be a Theodora girl, and whilst that is on my birthday list (just over 1 month til I’m 23, argh! ), I’m loving Glinda- and the new palette format is amazing. It’s sturdy, it’s transportable, and I LOVE the fact that you can swap in and out the colours. It’ll be perfect when I go on holiday in the Summer, for example. It all comes in a lovely box, with the same design on as the palette itself. I DO prefer the palette design of the Theodora palette- a pretty common opinion, it seems- but I love how ethereal this is. Definitely fitting of Glinda (and the lovely Michelle Williams!). I love that the photo card has details of how to use the products (see next photo). 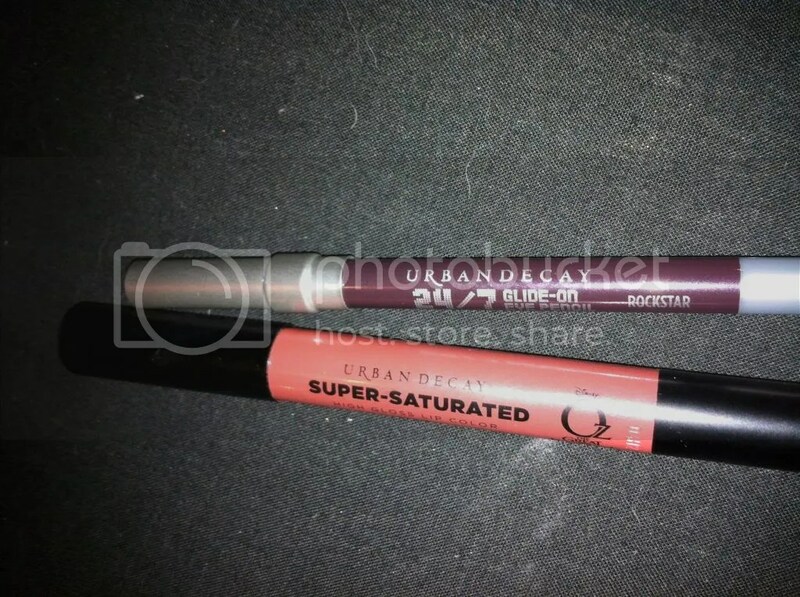 The palette also comes with a full-sized Super Saturated lip gloss/stick, in a colour that I think is pretty much the same shade as ‘Naked’. This is a MLBB shade for me, which is equal parts disappointing and awesome. Disappointing that I basically got a product that, whilst very moisturising and lovely to wear, works the same as a clear gloss. Still, the fact that it’s full sized is really good value for money! The instructional card is pretty decent, if I must say so myself, and is very handy if you’re a relative noob (like me) and need a few ideas to get you started. The shades are all full sized shadows- the same size as their mono-shadow range- which is great value for money, and it also includes two new duo-shades. I have to apologise for the quality of light in these shots! The shadows are all really, really pretty and they are so easy to pop out and in again in order to use the ‘custom’ nature of the palette. Well done, Urban Decay! It also comes with a half-sized 24/7 liner in ‘Rockstar’, which is a beautiful purple colour and a lovely change from black or brown. See! Lovely extras. Some people may be bummed it didn’t come with an applicator but that’s not such a big deal for me. I love the fact that you get these two products as well as six pans of awesome quality shadow. I also love the 24/7 pencil- it does exactly as it claims and simply glides on. It’s a little smudgy but that’s what I expect from a pencil, and it’s made me want to acquire a few more! As for the Super-Saturated lip colour- I previously mentioned it’s a MLBB shade for me, and whilst it is very good and definitely super saturated, I actually think there are cheaper High Street alternatives that do the same job just as well. I love the Oz names of these shades! 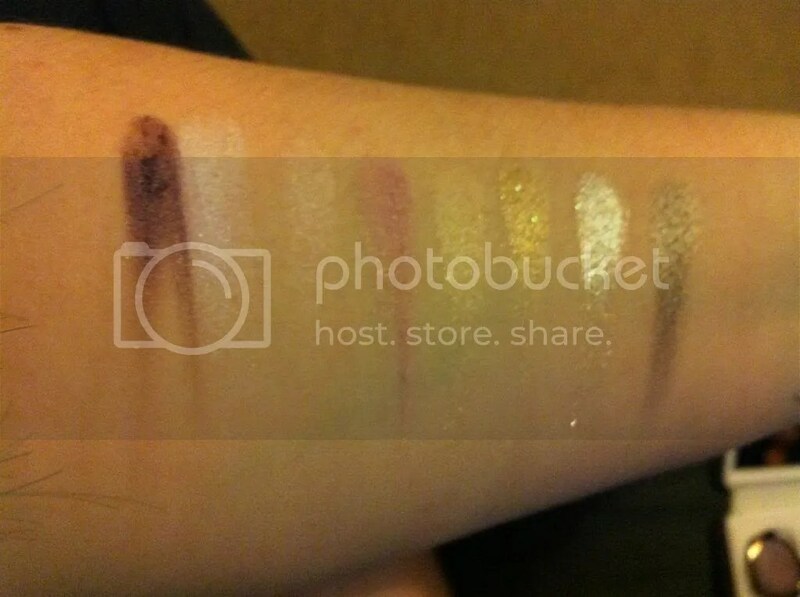 As you can see, these have typical levels of Urban Decay pigmentation. In my opinion, this is a decent range of colours and they all work well together. Most of these shades are metallic, shimmery or satin finishes, with one mega-glittery shade packed with the infamous Urban Decay micro-glitter, and they are almost all super soft and buttery and an absolute dream to work with. Tornado is a lovely aubergine shimmer colour, whilst Aura is the first of the duo-shades. One side is a white/iridescent blue duo-chrome, and the other is white-pink duochrome (that almost looks yellow in the pan, imho) with a really subtle shimmer. 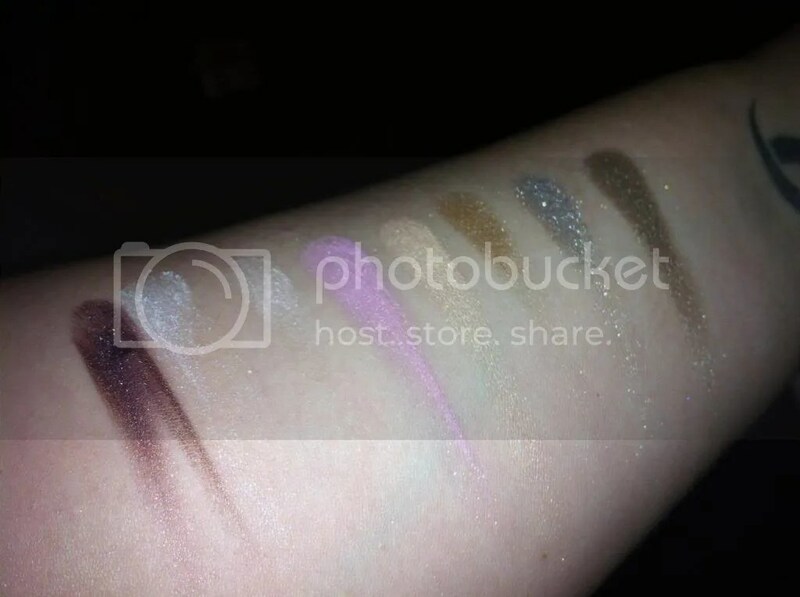 Both were pretty well pigmented for such pale shades (even though they don’t really show in the photos, boo!) but were definitely noticeably more powdery than the others; I’ve found they’re both good highlight shades. Magic is a LOVELY purpley fuschia pink with a golden undertone and shimmer, and I’m finding myself reaching for this the most often in spite of myself! Illusion is a frosty, warm golden peach and is a perfect base shade for me. Oz is the second duo-shade and the micro-glitter criminal! One side is gold with golden glitter, and the other silver with silver glitter- both super pigmented but, as expected, the glitter goes EVERYWHERE! It hasn’t stopped me using them, I just have to remember to do my eyes first or my foundation will need a touch up. South is a taupey brown with a metallic finish and even though I haven’t really used it yet, I love it. Perfect crease colour, super pigmented, really creamy. I think my favourites are Magic and South! God, I need to get to the eyebrow bar for a threading! Anyway, this is a quick look I cobbled together. I used Illusion as a base and blended it up towards my brow bone, then packed Magic onto the lid and the crease, and used the pink side of Aura in my inner corner and blended it out across the lid. Not too shabby, if I must say- I think I’m getting better! This was without a primer and lasted well over 8 hours with minimal creasing, and with a primer have lasted me all day. 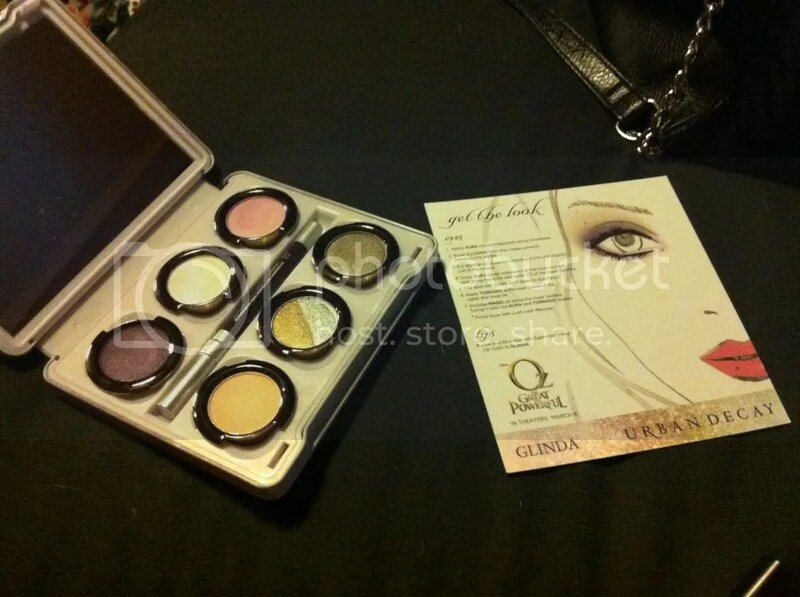 You can still buy both palettes from Debenhams or House of Fraser for £36, and I really like Glinda. For less than £40, you get well over £100 worth of make up. I’m hoping to get Theodora for my birthday 🙂 So, what do you think, fat fashion fans? Stay tuned for a sneak peak at a mini Primark haul I did the other day! 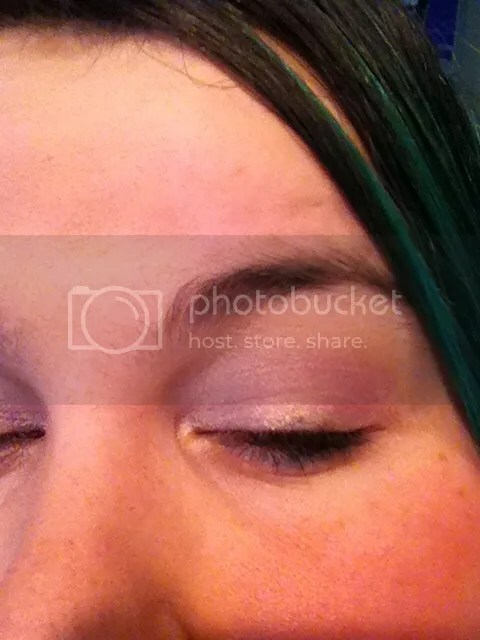 This entry was posted in Beauty, Hair, Makeup, Fashion Trend Alert, Fashion- Designer, Fashionista Musings and tagged beauty, Eyeshadow, Glinda, Glinda palette, make up, Oz, review, Urban Decay. Bookmark the permalink. 1 Response to Glinda: The Colourful and Sparkly! I don’t really wear eyeshadow much, but I love the idea of Wizard of Oz themed make-up sets 😀 I also have the messiest room in existence no matter how much I tidy it!